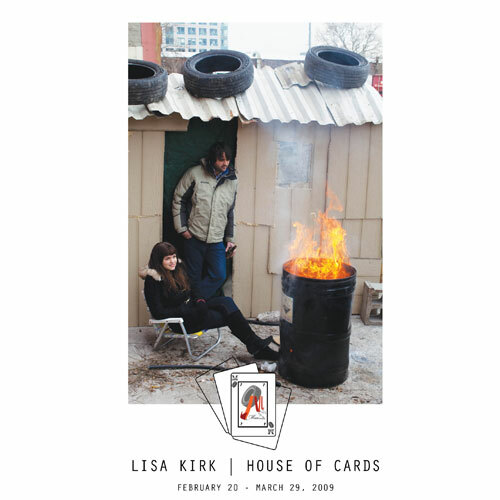 INVISIBLE-EXPORTS is pleased to announce a solo exhibition by Lisa Kirk, House of Cards. In the current economic crisis, Americans have been forced to reckon directly with the anxious and guilt-ridden underbelly of the late-capitalist system that has, for several generations, sustained us. For the last decade, Lisa Kirk has produced bold multi-media work and environmental installations that explore the spectacle of capitalism, terrorism and political violence. Her exhibition House of Cards offers a familiar yet deconstructed vision, drawn from our collective nightmare of a post-capitalist future. The work, maison des cartes, a show model “shanty timeshare” built from 52 separate pieces of found materials, will occupy the central space of the gallery, and will continue by transforming the gallery’s office into a functioning real estate salesroom complete with salespeople. There, viewers will be presented with the chance to buy into the private residence club. Upon the show’s completion, the structure will be rebuilt in a new location where shareholders will have the opportunity to experience shanty living. After 52 weeks, maison des cartes will be disassembled and distributed to the shareholders as 52 separate and unique artworks. Kirk’s work delivers a raw portrayal of the emotional experience of living in the early 21st century, but as much as House of Cards is social critique and satire, it is also a study in contemporary political imagery. The shanty is a powerful reminder of the Third World costs of Western wealth, the looming history of the Great Depression, and a harrowing invocation of the way we imagine the instability and insecurity of our own well-being. Lisa Kirk’s work has been exhibited at P.S.1 Contemporary Art Center | Museum of Modern Art affiliate; Galería Comercial, PR; Participant INC., NY; and MOT International, London. She has also contributed projects to North Drive Press, NY; Creative Time, NY; and Charlie, NY. Her curated projects include LEGION, Bonds of Love, at John Connelly Presents, The Outlaw Series and You. Her work has been reviewed in Artforum.com, L’uomo Vogue, Plan B, The Guardian, Time Out London/New York, The New York Times, The New Yorker, New York Magazine, and Art Review. INVISIBLE-EXPORTS is a gallery dedicated to superior conceptual work. IE is located in the Lower East Side, at 14A Orchard Street, just north of Canal. The hours are Wednesday through Sunday, 11-6:30pm, and by appointment. For more information, call 212 226 5447 or email: info@invisible-exports.com. (1) Hans Askheim, And Yet It Moves!, Exhibition Catalogue, MOT International, August 12-September 16, 2006.